Scientists and magnoliaphiles from 15 countries traveled to Varadero, Cuba, for the Third International Symposium on the Family Magnoliaceae. 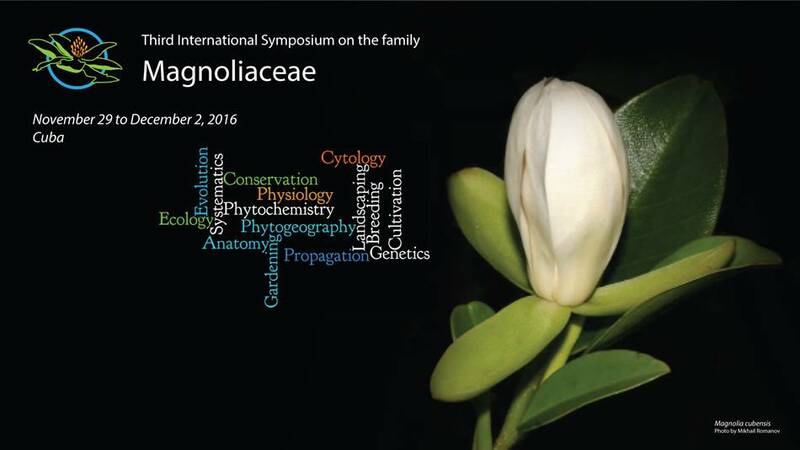 Held from November 29 –December 3, 2016, the Symposium provided an international forum for 76 participants to exchange the latest information on Magnolia biology and culture. Topics including conservation, biodiversity, ecology, nursery propagation, in vitro propagation, cryopreservation, taxonomy, fruit structure, and evolution were represented in a total of 20 presentations. In addition to scientific presentations, the four-day meeting included field trips to the National Botanical Garden of Cuba as well as the coast of Matanzas and the mountains of Topes de Collantes to view rare magnolias in their natural habitat. The Symposium fostered networking and collaboration among participants to advance knowledge and identify major priorities that contribute to conservation of magnolias worldwide. The 2016 International Symposium on the Family Magnoliaceae built upon the scientific successes of the first two Magnoliaceae symposia held in China in 1998 and 2009 and the International Symposium on Neotropical Magnoliaceae held in 2015 in Ecuador. Institutions organizing the 2016 Symposium were the Cuban Society of Botany (represented by Alejandro Palmarola Bejerano, President), “Planta!” PlantLife Conservation Society (Luis González Torres, Director) and Magnolia Society International (Gary Knox, President). Presentations (by author) - click on author to download PDF presentation. Castillo - Fundación Progressio. Reserva Científica Ébano Verde. Chávez-Cortazar - Assessment of genetic stability in somatic embryogenesis regenerated plants of Magnolia dealbata. Folgado - Cryopreservation of Magnolia macrophylla var. ashei shoot tips by droplet vitrification. Gómez - Habitat and population structure of Magnolia cristalensis in Sierra de Nipe and Alto de Iberia, Cuba. Gratzfeld - Linking conservation prioritisation and practical action – Saving the world’s most threatened magnolias. Gutiérrez-Lozano - Current status of populations of Magnolia rzedowskiana (Magnoliaceae) in the Sierra Madre Oriental, Mexico. Knox - Factors affecting health, reproduction and distribution of the endangered Magnolia macrophylla var. ashei. Liu - The Current Situation and Development of Yulan in Nanzhao County, Henan, China. Molina Pelegrín - Population structure of Magnolia cubensis subsp. cubensis in the Ecological Reserve “El Gigante”. Nam - Notes on taxonomy and conservation of Magnoliaceae from Vietnam. Oviedo Prieto - On the biology of Magnolia virginiana subsp. oviedoae in Cuba. Serna González - What do we know about ecological interactions of Colombian Magnolias? Vázquez-García - Evolutionary and morphological relationships in Magnoliaceae: an update. Veltjen - Conserving the Magnolia diversity of the Caribbean islands: progress and prospects.